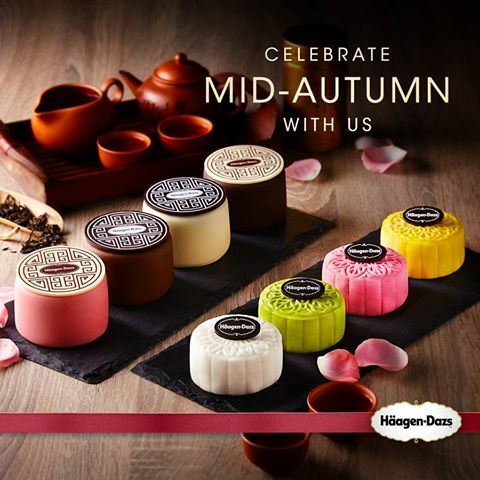 Make your Mid-Autumn festive a cool sensation with frozen treats of Häagen-Dazs™ Mid-Autumn Mooncake Collections! The premium ice cream brand that we all love, has recently introduce a new Snow Skin Ice Cream Mid-Autumn Mooncake Collection perfect for our Mid-Autumn festival amidst our country’s eternal summer. The new collection joins the brand’s much-loved Classic Collection of chocolate coated ice cream mooncakes. Taking limelight in both collections, Häagen-Dazs™ also introduces the newly released Royal Milk Tea flavor ice cream in mooncakes. Royal Milk Tea boasts the perfect blend of premium fresh and sweet Darjeeling tea and strong, malty and honey-like Assam tea to deliver the most delicate yet intense floral flavors. The Snow Skin Ice Cream Mid-Autumn Mooncake Collection is so pretty at sight, making it a very beautiful gift for family, friends and loved ones. Packed in a pretty pastel sweet box with dry ice, there are four flavors to savor this festive season. The snow skin is beautifully thin and has a soft and lightly chewy mochi texture, coupled with Häagen-Dazs™ premium ice creams, these icy treats are refreshing and lusciously delicious. Choosing a favorite is rather difficult since I really enjoyed all the flavors, especially the cream Royal Milk Tea! The Classic Ice Cream Mid-Autumn Mooncake Collection makes a comeback due to popular demand. Each one is hand crafted and takes two days of artistry and craftsmanship, the Classic Collection has Häagen-Dazs’™ signature indulgent ice creams coated with lush white chocolate, milk chocolate, dark chocolate and strawberry chocolate. Each Classic Collection mooncake also has a hidden surprise of a mango sorbet “yolk” for a burst of fruitiness amidst the creamy decadent chocolate and ice creams. Don’t miss these gorgeous frozen treats as a new twist of flavor this Mid-Autumn festive. It is a festive of gathering and spending precious time as well as a season for giving and receiving gifts of mooncakes. Both Häagen-Dazs™ Mid-Autumn Mooncake Collections make gorgeous icy treats this festive and are simply made for sharing with family, friends and loved ones. Häagen-Dazs™ Mid-Autumn Mooncake Collections are available at all Häagen-Dazs™ outlets till 15 September, 2016.